It was with great sadness that we learned that our former MLBB partner, Walter F. Bruder, passed away on October 13, 2017. Walter was known in the automobile dealer industry as a consummate lawyer, particularly a highly competitive and excellent trial lawyer. He had the knack of being able to go to the heart of the matter quickly, avoiding some of the extraneous and unproductive matters that sometimes find their way into litigation. His vibrant personality and infectious sense of humor always kept everyone on course in seeing the big picture. When Walter retired he bought five acres of land on Maui, Hawaii, and built two homes on the property, doing a great deal of the planning and construction work himself, transforming raw land into an absolute tropical paradise. Walter was also an artist and experimented with many different art forms, a truly renaissance man. He always remained in contact with the firm and we enjoyed his visits over the years, especially hearing his stories about the good old days. He will be missed, Rest in peace, Walter. 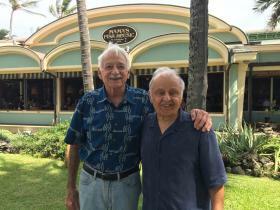 Here is a photo of Joe Berberich's visit with Walter on Maui a year ago.